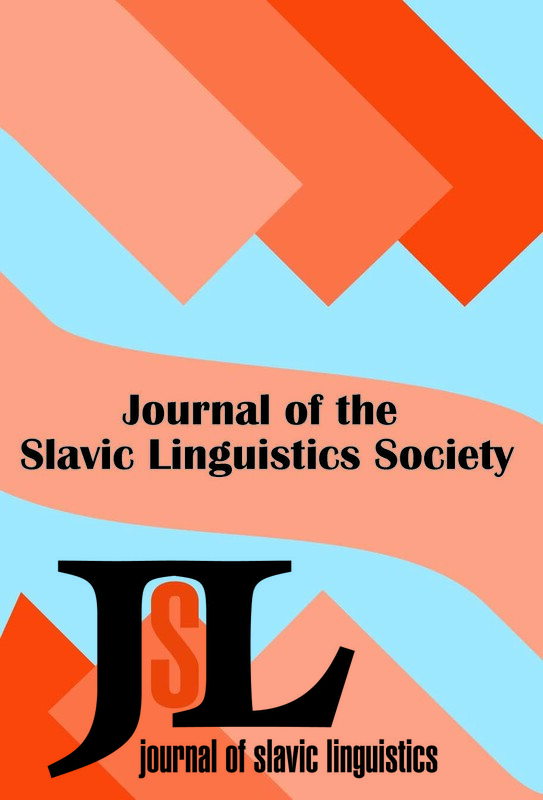 Abstract:In the archaic dialects of the Vladimir-Volga Basin dialect group, the immediately pretonic vowel constitutes a strong position that is equal or superior to that comprising the stressed syllable. These dialects have increased vowel duration in the tonic and immediately pretonic syllables and a fixed rising-falling pitch contour over the two. Because these dialects generally have vowel reduction elsewhere, the special properties of the pretonic syllable are particularly intriguing. Recent research on vowel reduction/neutralization in Russian (Crosswhite 1999/2001, Barnes 2002, 2006, Padgett and Tabain 2005, Padgett 2004) does not systematically deal with this type of word prosody. The Vladimir-Volga Basin dialects form part of the Central Russian dialect group where the immediately pretonic position in general has special status. I argue that the peculiar prosody of the archaic Vladimir-Volga Basin dialects is due to the presence of both stress and tone in their phonology. Pretonic duration is a consequence of mapping a high tone (H) and a pitch rise to the pitch peak in that syllable. There is some evidence to suggest that this type of word prosody is older than the stress prosody of Contemporary Standard Russian (CSR), and it may represent a stage in the transformation of the Common Slavic (CS) pitch accent system to an East Slavic (ES) stress-based one. Abstract:The feature [ATR] is usually used exclusively for the description of vowels. In this article, it is argued that phonotactic constraints in Polish indicate that [ATR] may be a useful dimension in the description of consonants. Under this assumption we are able to offer a straightforward and phonetically motivated account of the discussed phonotactic constraints and relate them to palatalization processes in Polish. The consequence of the assumption that [ATR] is a consonantal dimension is a reanalysis of some palatalization processes in terms of [ATR] and the identification of the need for a new typology of palatalization processes. Abstract:This paper examines allomorph distribution in the locative of masculine and neuter nouns in Polish. Locative allomorph distribution is opaque and is accounted for in terms of preserving contrast. The key idea is that the different allomorphs of the locative suffix keep apart forms that the regular phonology would otherwise neutralize. This contributes to the body of work on morphological opacity and the role for paradigmatic contrast. Abstract:This paper investigates the issue of the abstractness of children’s underlying representations, focusing on the acquisition of a complex morphophonological system. The data from three Polish-speaking children exhibit regular alternations which are caused both by adult-based processes already acquired, as well as child-specific processes triggered or blocked in the variable phonetic environment of derivational and inflectional morphemes. The interplay between child-specific and adult-based processes within an individual system, opacity effects, and, generally, phonological behavior of segments reveal adult-like distinctions and point to abstract adult-like representations based on morphophonological alternations rather than directly on adult surface forms. Abstract:This paper provides an explanation for a sound change affecting Polish by which palatalized palatoalveolars became retroflexes. An extension of the account to a similar (but probably independent) Russian sound change is also considered. We argue that the sound change was motivated by the needs of perceptual distinctiveness within a rich sibilant inventory and provide an analysis within the framework of Dispersion Theory. This analysis is further supported by a typological survey and by phonetic data. This case study supports the view that “unconditioned” sound changes, and allophonic rules resulting from them, can be motivated by contrast, and further shows that the notion of dispersion in phonology can be usefully applied to consonants. Abstract:One of the significant consequences of the autosegmental theory of representations is a different way of drawing the distinction between glides and vowels. The distinction is made in terms of syllable structure rather than in terms of the feature [±syllabic], as was the case in SPE phonology. This article pursues the problem of the glide-vowel distinction for Polish and shows that with few exceptions this distinction is derivable from distributional generalizations. The generalizations are first stated in terms of rules and then reanalyzed in terms of OT constraints. It is argued that the OT-based analysis is superior to the rule-based analysis.